Kristi and I outfitted our space with reclaimed furniture from Craigslist (also known as “cheap”), so we wanted to keep it going with a desk. My setup at our kitchen table was less than ideal, and we’d been wanting a desk for me for a while. We saw that others have commissioned desks with great success, so we gave it a shot. A few emails and $150 later, I’ve got a standing desk. There are guides for building $25 standing desks, but since my work station is a part of our living room, we wanted something that looked OK.
One Craigslist add later, we had a desk. We paid Drew Morris $150 for the desk, and are thrilled. 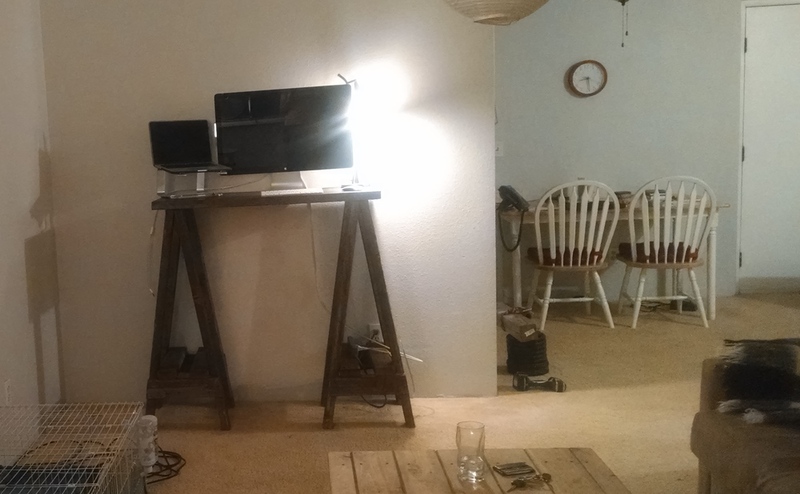 (If you’re in the Denver area, and want a standing desk, reach out to Drew.Morris82( )yahoo. I’ve been using the desk for only half a day, so I don’t have much to say, other than I really like it so far. More information to come soon! No longer on the kitchen table!